RP2W Robot: What’s Under the Hood? The RP2W robot is a telepresence robot with a three-wheel mobile platform, a pan-tile camera, an on-board net-book equipped with WiFi, microphone and stereo audio output. The mobile base has three wheels: two independently powered front wheels, and one passive rear wheel for stabilization. 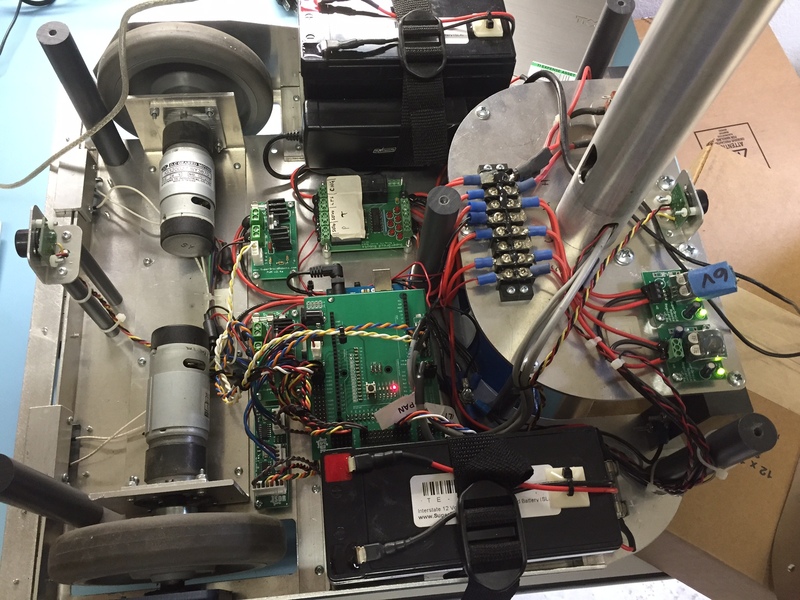 Each wheel is powered by a DC motor with a 24-bit digital encoder attached to its shaft for position measurement. The motors are each driven by a PWM amplifier controlled by two digital I/O–one for +/- direction, one for ON/OFF. The motors and the sensors are ultimately connected back to an Arduino Mega 2560 controller for data acquisition and control. The Arduino also reports data to the host, and receives commands from the host, over a FTDI USB-serial cable. The default host that comes with the RP2W is an Asus net-book. RP2W’s base houses most of the electronics. The base of RP2W houses most of the electronics. The front and back of the base each has a sonar sensor. The two 12V lead acid batteries are connected in parallel. Their terminals are connected to two copper contact plates at the back of the base for charging when docked. A flip switch connects the 12V to the rest of the system through a power distribution screw terminal. A 12V to 6V voltage regulator and a 12V to 5V voltage regulators are used to provide 6V and 5V rails needed by the rest of the electronics. There are two banks of I/O controlling various functions: digital1 and digital2. digital1 control the relays that connect and disconnect power to the camera’s pan-tilt servo motors.